Candidates interested in testing for the Deputy Sheriff Trainee position may submit their application by following the link on the 'current job openings' tab. You may also visit the San Bernardino County Human Resources website at www.sbcounty.gov/hr to submit your application online. Once approved, Human Resources will e-mail you a link to take the online test. The test is scored on a "total points" basis. All applicants must accumulate enough points to meet the minimum passing score. The applicant will be interviewed to determine his/her qualifications. If successful, the applicant will be given a Personal History Statement (PHS) packet to complete. The applicant will be called for an interview with their assigned background investigator. During this step, the applicant will also be fingerprinted and submit an autobiography. A polygraph examination will be administered to verify information obtained during the background interview. The background investigation will include checks of current and former employment, police, financial, education and military records as well as interviews with family members, neighbors, supervisors, co-workers and friends. 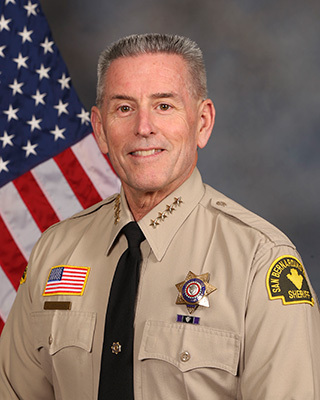 The Department interview will be conducted by a member of the Sheriff’s Executive Staff and either the Commander or Lieutenant of Employee Resources Division. The panel will evaluate candidates to assess their interpersonal skills, oral communication skills and qualifications for a Deputy Sheriff. If successful, the candidate may be given a conditional job offer. The medical evaluation is thorough and it is essential that you be in excellent health with no conditions which would restrict your ability to safely do law enforcement work. The psychological evaluation consists of an individual written questionnaire and oral interview by a psychologist on factors related to successful performance in the difficult and stressful job as a Deputy Sheriff. If the candidate is successful in the previous nine steps, the candidate is scheduled for the next available Sheriff’s Academy.